Over the weekend I gave Jon a list of about 15 meal ideas so he could help me decide on our menus for the week, and one that he picked was Chicken Parmesan. I made it last night for Jon and my parents. I have chicken parm in this blog already, but I made it a little differently this time so I thought I'd repost. This is something I didn't do last time, but it really helps to keep the chicken moist. After pounding the breasts out just a bit, I marinated it for about 6 hours in a mixture of olive oil, freshly chopped basil, black pepper, and finely chopped red onions. I would normally use garlic, but I didn't want to overwhelm my mom with too much garlic! Remove chicken from the marinade, remove large pieces of basil and onion. Dredge each piece in flour, shake off excess, dip in egg, then coat each side with breadcrumbs. Place in the baking dish. Bake on 400 degrees for about 20-25 minutes, flipping once. Check to make sure chicken is cooked. Top each piece with slices of Parmesan cheese, some sauce, and then some shredded cheese. Return to oven, bake a few minutes, and then turn the broiler on for a few minutes at the end. 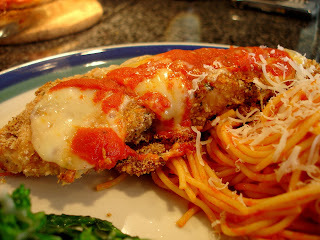 Chicken parm is traditionally fried, but I wanted to keep it a little healthier by baking it. I think Jon was worried that it wouldn't be crispy, but it was! Actually, it was even crispier than I thought it would be. I believe adding cheese to the breadcrumbs, using the cooking spray, and turning on the broiler at the end contributed to the crispiness. 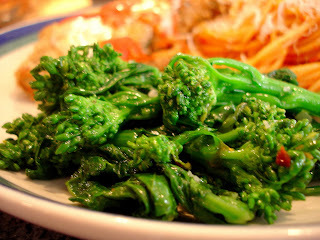 We often cook broccoli rabe with pasta, but I always forget about it when I'm making a veggie side. Since normally used in Italian cooking, it was a no brainer to make it along with the chicken parm. I love the bitterness and the crunch - but if you have never tried it, don't let the bitter flavor scare you away. It's really more of a subtle bite that comes out after the initial taste. Bring large pot of water to a boil. Add broccoli rabe and cook for 3-4 minutes. Remove from pot, or dump out the hot water, and immediately run the broccoli rabe under cold water to stop it from cooking. We don't want limp or mushy rabe! Add broccoli rabe, red pepper flakes, lemon juice, and salt. Saute until every piece has been coated with the oil and garlic. Serve immediately. I grated some fresh Parmesan cheese on top of the entire platter. Hope everyone has a good week! I'll be back later this week with a review of a new pasta dish I'm trying, as well as Enchiladas Suizas. I just wanted to say what a fantastic blog this is- I happened upon it by chance while on the WFD nestie board, and I spen tthe last couple hours going through it and copying down recipes that sounded good. Thanks to you I probably have dinner for the next month planned out. I will definitely be visiting frequently! Thank you, Amanda!!! I hope you like the recipes and have fun cooking them!! !